Happy Monday! Or is it? Letting go of a summer weekend is never easy. Too much fun to be had this time of year! And with dinner like this, you’ll feel like summer is never going to end. Perfect. Does that look delicious or what? Yeah, it was. And it only took about 15 minutes to make. Love. Oh, and I just sent an email to my giveaway winner – click here to see if it was you! Cook pasta according to al dente directions. A few minutes before pasta is done cooking, remove one cup of boiling water from pot. 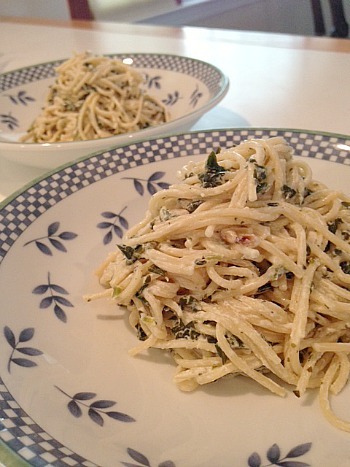 In a pot over medium heat, stir goat cheese into 1/2 cup pasta water until cheese is dissolved. Add parsley, lemon juice and zest. Stir in spinach until just wilted. Add pasta to cheese mixture and mix until light and creamy (add a bit more water if necessary). Mix in pignoli nuts. Season with salt and pepper and serve. This entry was posted in cheese, goat cheese, lemon, main dishes, pasta, pignoli, QuickAndEasy, Uncategorized. Bookmark the permalink.